Wild Iris Dress https://www.review-australia.com/au/wild-iris-dress-blue/RE19DR218.REBLU120.html Have some fun in the Wild Iris Dress! With a delicate cowl neckline, cross-back spaghetti straps and a contrasting floral print, this dress is perfect for summer celebrations and gatherings. Featuring light, floaty fabric with translucent pleated overskirt and blue under lining. 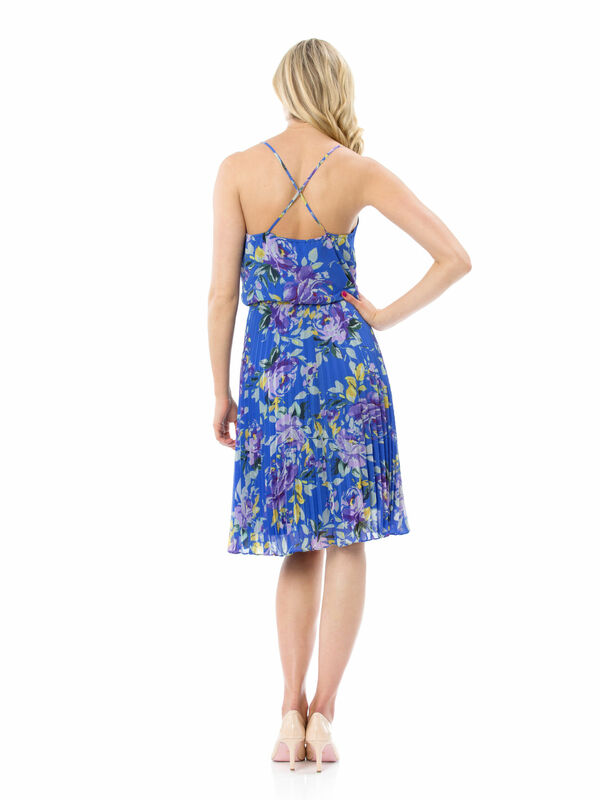 Have some fun in the Wild Iris Dress! With a delicate cowl neckline, cross-back spaghetti straps and a contrasting floral print, this dress is perfect for summer celebrations and gatherings. Featuring light, floaty fabric with translucent pleated overskirt and blue under lining. Wild Iris Dress is rated 4.8 out of 5 by 27. Rated 4 out of 5 by Pj63 from lovely fitting. I love it I am happy I bought it, especially if was discounted price. it's beautiful. Rated 5 out of 5 by Maria from Beautiful Summer Dress! I love the lightweight and floaty fabric of this dress, and the colour is just spectacular! This dress is very eye catching and looks so beautiful on, not to mention how comfortalbe it feels. I also love the cross back, the pleats and neck line, its so unique. Thank you review for this gorgeous summer dress! Rated 5 out of 5 by Watermelonella from Great fabric! I bought it a month ago for a wedding party and the lady in the shop helped me so lovely to find a perfect dress and it's just perfect!! perfect size, design and high quality fabric, very light and a show off as well. hand wash only with cold water to keep it special. Rated 5 out of 5 by AlyceS from Stunning with just the right pops of colour This dress is absolutely stunning. It sits snug in all the right places and flows freely in others. Comfortable and classy with beautiful pops of colour that draw all the right attention. Had plenty of compliments after wearing it to a wedding recently. Rated 5 out of 5 by Tashlovesvintage from Lovely, floaty, cool and pretty! I almost didn't buy this dress but when I tried it on I fell in love! This design made me nostalgic for favourite old movies, and it's so comfortable on. Great for the summer heat, day or night. This floaty design is in my top 10!